ANYBODY who has watched the various ‘crime scene’ television serials will have probably have seen the use of ultraviolet (UV) light to disclose trace evidence. While the dramatic representations are not exactly true to the procedures in real-life forensic evidence gathering, the use of UV is a valuable tool in actual crime scene investigation. Resolve Optics has launched a new multi-purpose lens which it says offers high performance in both UV and visible light, which may make work at the crime scene a little more efficient. The Model 228 allows an image to be focused in visible light, and then captured in UV after simply sliding an internal UV filter into place. Critically, the image does not have to be refocused. While it may seem that, on television, all evidence fluoresces under UV, in reality this is not the case. Nevertheless UV imaging is a powerful tool in forensic investigations and is widely used in the imaging of latent fingerprints, bite marks, and other so-called ‘pattern injuries’ on skin. It is also sometimes useful for the imaging of shoeprints on surfaces where visible-light contrast is low. The Model 228 claims ‘unmatched’ high-resolution macro imaging, with the capability to image objects from infinity to 1:1.25 magnification without needing adapters. The field of view is 8.3deg at full magnification, and up to 16.6deg at long distance. The company says that this wide field of view and the high transmission qualities of the optical coatings used make the Model 228 more light efficient than lenses offering an identical view. 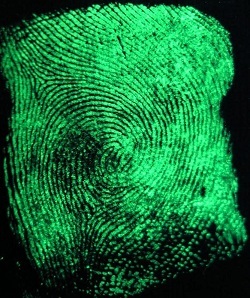 The Forensic UV Lens offers high-resolution crime site macro viewing, for fingerprinting and human skin damage applications in particular, by imaging onto a reflective ultra violet imaging (RUVIS) scope with 1:1 magnification, while matching precisely the optical resolution of lens and image intensifier.